The Savvy Stamper: In the Mood For Snow...men! Good evening! So to say the least, I am not a winter person as I've said, but I can appreciate a good snow or two. I love how clean and new everything looks covered in a world of white (especially if I don't have to drive in it!) But I do also love everything snowmen. I blame it on my mother (she has the same problem;)). I fell in love with the little guy from TiddlyInks and this will be going to another snowman lover in my family for her birthday! Supplies are: Image by TiddlyInks colored in with Copics and accented with Crystal Stickles. SU cardstock in Certainly Celery; DCWV white core cardstock. DP is from the DCWV winter mat stack. Snowflakes are punched vellum sponged with silver ink. Ribbon is from my stash, and pearls are Kaiser. The background is also embossed with a Sizzix embossing folder. nice card and lovely colors. Oh this is so sweet! 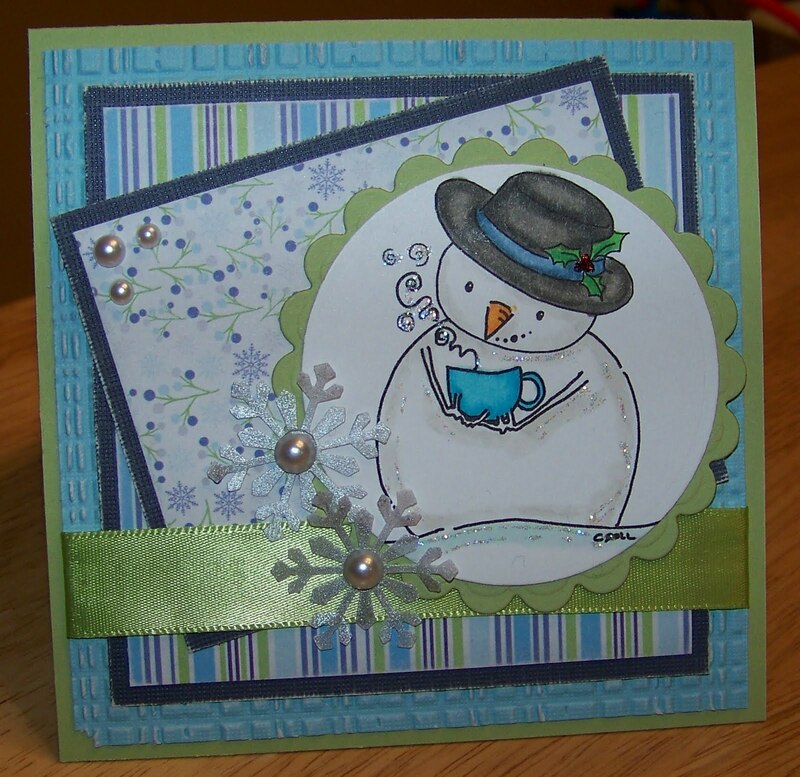 I love the pretty colour scheme and the snowman is adorable too! Thanks for joining in with the Sweet Stop Sketch Challenge! Very cute, I love the image and colors you used! 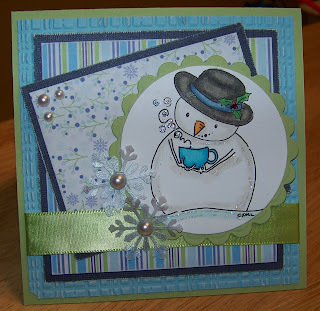 So adorable Colleen...I love the embossing in the background and the layout! Aw I love this!!! Super cute snowman and I LOVE the colors. adorable snowman! this is a beautiful card Colleen! What an adorable snowman! Love your coloring and all the layers! Great DP choices and the ribbon is just perfect! Happy Thanksgiving! This is a fantastic card!! That little snow guy is adorable! You have some fantastic snowmen images! Lovin' this one with his warm hot chocolate!